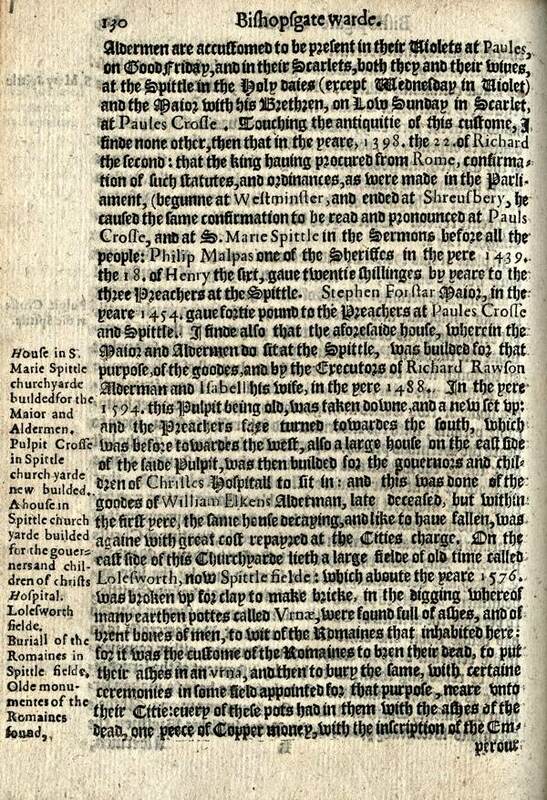 To pass the time while awaiting the arrival of Bob Mazzer’s Underground from the printers for next week’s launch on Thursday 12th June, I visited the Bishopsgate Institute yesterday to study the 1599 copy of John Stow‘s Survey Of London. 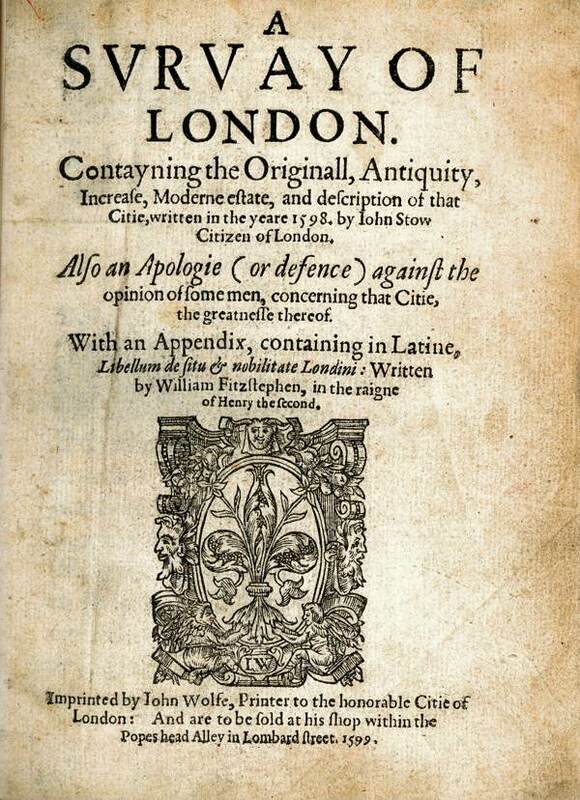 It was touching to see the edition that John Stow himself produced, with its delicate type resembling gothic script, and sobering to recognise what a great undertaking it was to publish a book four hundred years ago – requiring every page of type to be set and printed by hand. Interesting to read of the growth of London four centuries ago and the pressure to rebuild the city, in ties in with your blog earlier this week about buildings lost and under threat from redevelopment the city. They TASTED the liquid in the Roman bottles!!!!!! …. is a gemstone, and articulates beautifully what I too feel for the capital but never knew how to express. Thanks GA, another wee gemstone. I want to say thank you for all these wonderful items you introduce here. My mother was from East Ham and I went to college in Moorgate in the 70s. I worked in Bishopsgate as a secretary in a Commodity Brokers in the early 80s as well as at various other jobs in the City for 10 years. Even though I knew there was history all around me, I am amazed at the levels of industry you find and thrilled that there are still people practicing their skills. I have great respect for what you are doing and you make it a pleasure to read every morning, unlike the newspapers. I love old books — they will be for ever and never pass into nothingness …! 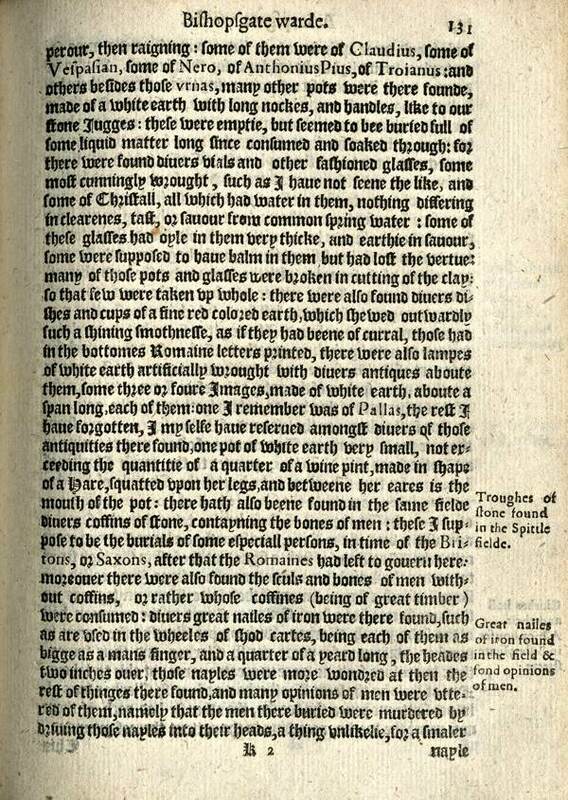 The printers’ colophons interest me: usually very specific as to where the book might be sold – in this case ‘his shop within the Popes head Alley in Lombard street’. One I found recently was in a book ‘Printed by Thomas Milbourn, for the Author, and are to be sold at his House next Door to the Gun in Little Moorfields ; by D. Newman at the King’s-Arms in the Poultry, and W. Cooper at the Pelican in Little Britain’. What better way to find your bookseller, settle the price, and then talk books over some ale! 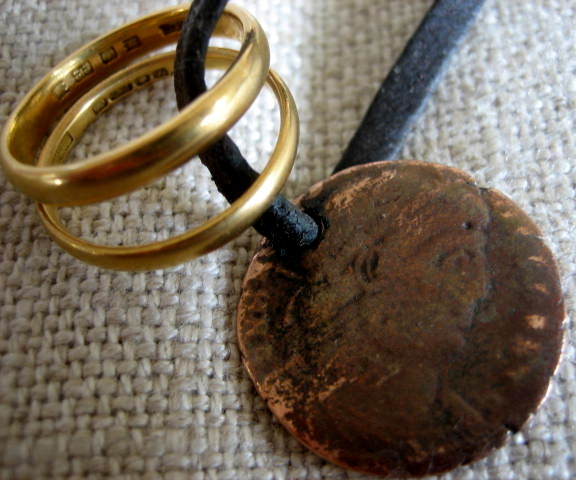 A fascinating article about the Roman cemetery and the grave goods our ancestors found in it! I wonder if a thousand years from now, our modern cemeteries will be archeological digs, and our descendants will cherish the things they find, as you now lovingly wear the ancient copper coin! Historians of those days are no different from today. 400 hundred years from today people would marvel at our history and would probably be as quaint to them as the 15th century were quaint to us. The people in the future would also probably be as nostalgic as we are. 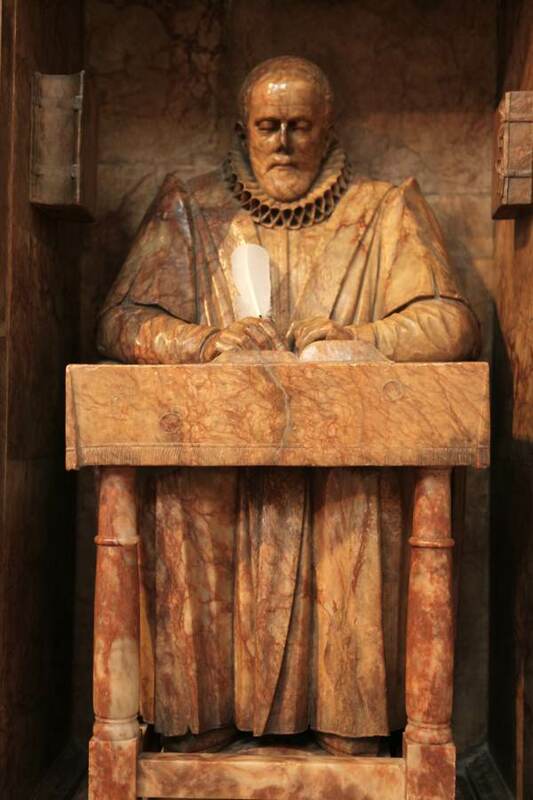 can anyone tell us what the stone (presumably marble) that has been used to create the john stow statue? a miraculous piece almost of a piece.